Since our Constitution allows us freedom of choice, I took advantage of this today, but it was agonizing. Over at Carnegie Hall, Emanuel Ax and Yo-Yo Ma were playing an all-Brahms concert, to which, the New Yorker wrote, “all roads go.” But I’ve heard them play Brahms before, I knew how fine it would be, so my choice was way downtown. Yes, a cello (the estimable musician, writer and conductor Kenneth Woods), but everything else was different. America’s finest shakuhachi player, two world premieres, a rare work by the sadly rarely-performed Polish-Russian genius Mieczyslaw Weinberg, seven of György Kurtág’s epigraphic gems, and an early Beethoven. Whatever the road to Carnegie Hall, I preferred to walk to the Terri Cultural Institute. The art (a rice-paper faux-ceiling, revealing objects slowly through the clouds) and the music were both challenging and inventive. And for those who, like myself, have felt that the shakuhachi is fine for heavy breathing and Zen-style meditation, James Nyoraku Schlefer had a few surprises. I had heard him before, at BargeMusic, where his Sankyoku No. 1 for koto, shakuhachi and cello was a quirky amalgam of Japanese and light jazz. 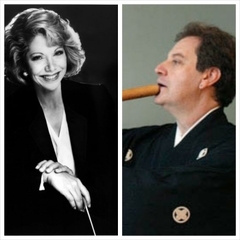 What I hadn’t known was that the shakuhachi came in various sizes and registers, so he played two of them with an old partner, cellist Kenneth Woods, who had conducted his Shakuhachi Concerto. Here, the colors of cello and Japanese flute were carefully and felicitously blended. The work was called Sidewalk Dances, embracing Mr. Schlefer in the city (fast) and more leisurely in the countryside. But there was Zen breathiness with his instruments, which could have been wood recorders. (Except that you can’t get a true glissando on recorder as you can here.) The moments of the tenor shakuhachi and tenor cello were surprisingly beautiful. The other sections were surprising for their lightness, seeming ease and joy of playing. In the final section Mr. Schlefer’s jazz treatment made him a veritable Herbie Mann with a fairly jazzy cello on the side. The other world premiere, also commissioned by Kyo-Shin-An Arts, was far more Japanese, since it was based on the Akira Kurosawa film Rashomon. It takes more than a little chuzpah to create original music for this movie of crime, illusions, moods and enigmas. Fumio Hayasaka’s original music was as haunting as the film (Kurosawa was as careful with his composers as with his actors), but Victoria Bond composed an original work inspired by the “crime and variations” of that 1950 classic. 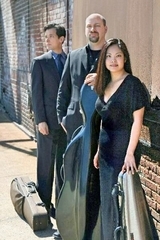 The work with Mr. Schlefer and the wonderful trio of the evening, Ensemble Epomeo, was a not totally convincing mixture. Starting off with a pentatonic Japanese motive, it moved onto a theme played by cello, joined by the Japanese flute, with a series of variations, themselves based on parts of the film as well as musical forms. That was a high-wire act, but Ms. Bond is most deft composer, and she had a few stunning moments. One could hear the violence through the dissonance, follow with a slower “calculation” and finally burst through with more violence, disguised as passion. It was a clever invention, for Ms. Bond is a most capable composer, and her first venture with the Japanese instrument was a happy partnership. But trying experiments with one of the only perfect films ever made is like gilding...well, gilding the Japanese chrysanthemum. The seven works were dissimilar. An out-of-tune Romanian dance, a crazy waltz, an embrace of softness...each demanded not only full attention from the audience, but from this entrancing group, the most dexterous execution.